LIMITED EDITION. Toys That Kill hail from San Pedro, CA. They've managed to put together an updated take on the classic punk sound: buzz saw guitars, hook-filled choruses, appropriate tempo changes, and those snot-filled vocal styling we all love so much. With two full-lengths on their own Recess Records, the band has sold over 10,000 units and have an extremely loyal following. 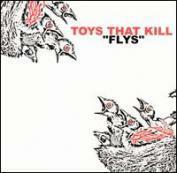 Forming from the ashes of legendary punk band F.Y.P., the TOYS THAT KILL gang are powering ahead with some amazing new music. This four-song EP will be a limited edition press. Which means it will be gone in the first week of distribution. Make sure to get your order in before it's too late.